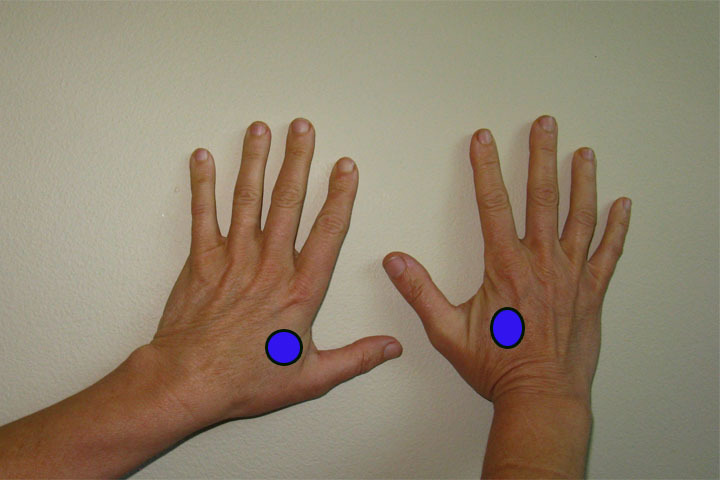 Located on either hand between the thumb and first finger is an acupressure point called Large Intestine-4, or Hoku. This is one of the most powerful points for a variety of complaints including constipation, headaches, and digestive woes. During labor it is particularly useful for reducing pain and encouraging contractions. THIS POINT IS CONTRAINDICATED DURING PREGNANCY BEFORE 38 WEEKS GESTATION! It's fine to do hand massage, or to explore how the point feels, but repeated acupressure to this spot is not considered appropriate during pregnancy until one is expecting labor to begin soon. Acupuncture stimulation of Large Intestine-4 for 15-30 minutes has been shown to produce enough endorphins to be successful pain relief for dental surgery. Some studies have indicated that rubbing a bag of crushed ice, or an ice cube, on this point during labor can help to reduce contraction pain. In this study, 49 pregnant women used ice massage on the point during early labor, at the beginning of each contraction and continuing until the contraction stopped. During the next contraction, the ice was rubbed on the opposite hand. This continued for 20 minutes or 4 contractions. Women reported pain reduction by nearly 50% when ice massage was used in the left hand, and by 19% in the left hand. Learn more about using this point with Touch Techniques for Birth DVD.